Grand Prix racing returned to Monte Carlo for the first time since 1950 and there was a good turnout despite the fact that only 20 cars would be allowed to start. Mercedes-Benz arrived with two short wheelbase cars and these were driven by Juan-Manuel Fangio and Stirling Moss while Hans Herrmann was given one of the usual cars. He crashed heavily and injured himself quite badly and Andre Simon was called in to replace him. Fangio took pole position but Moss was pushed back to third on the grid by Alberto Ascari in his Lancia. Eugenio Castellotti's Lancia shared the second row with Jean Behra's Maserati while the similar cars of Roberto Mieres and Luigi Musso were split by Gigi Villoresi's Lancia on row three. Further back Mike Hawthorn made his first appearance in a World Championship event in his Vanwall. 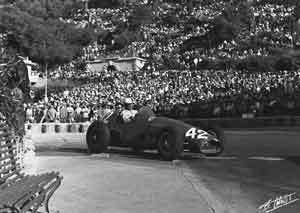 At the start Fangio managed to get ahead at the first corner and was followed by Castellotti, Moss and Ascari. Farina was an early casualty with a damaged wheel which needed replacing. Castellotti was able to hold off Moss for the first five laps but by then Fangio was too far ahead for Moss to be able to catch him. Ascari scrambled past Castellotti but the two began to battle and Behra joined in and it was the Frenchman who finally emerged ahead. Castellotti had to pit because of a deflating tire and Behra had to call in for more oil. Then Fangio stopped, the victim of a broken axle. Moss remained in the lead until the closing laps when his engine blew up. At almost the same moment Ascari, perhaps distracted by Moss's problems, crashed at the chicane and went straight into the harbor, through hay bales and sandbags. Fortunately he was not hurt and soon popped up and swan to safety. This left Trintignant in the lead and although Castelotti tried hard to catch him, the Frenchman came home the winner. Castellotti was second with Maserati's Cesare Perdisa third in Behra's car, the two men having switched cars in mid-race when Behra hit trouble.